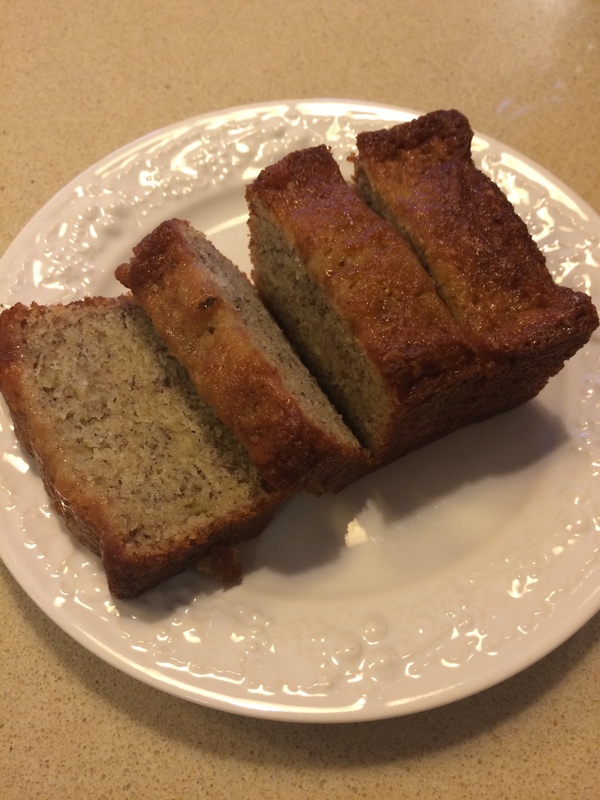 This is a simple and delicious Banana Bread. 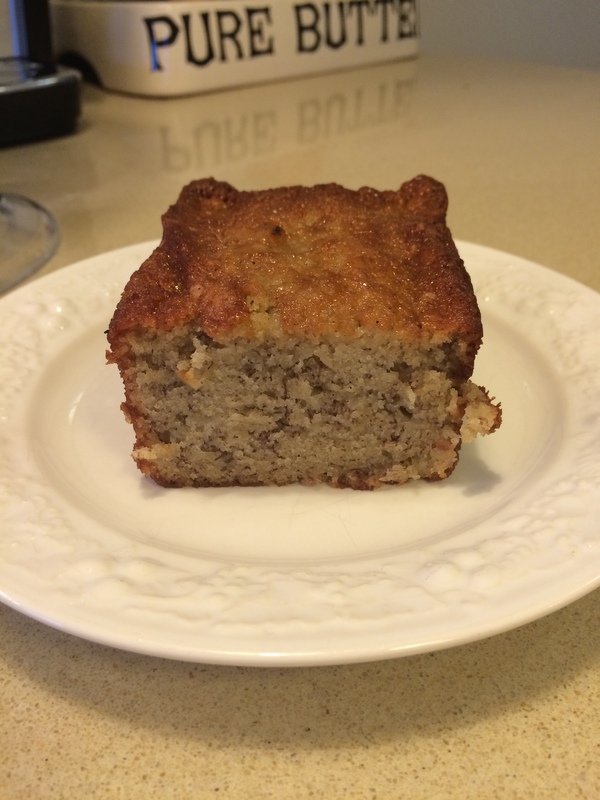 A “no frills” amazingly delicious banana bread. 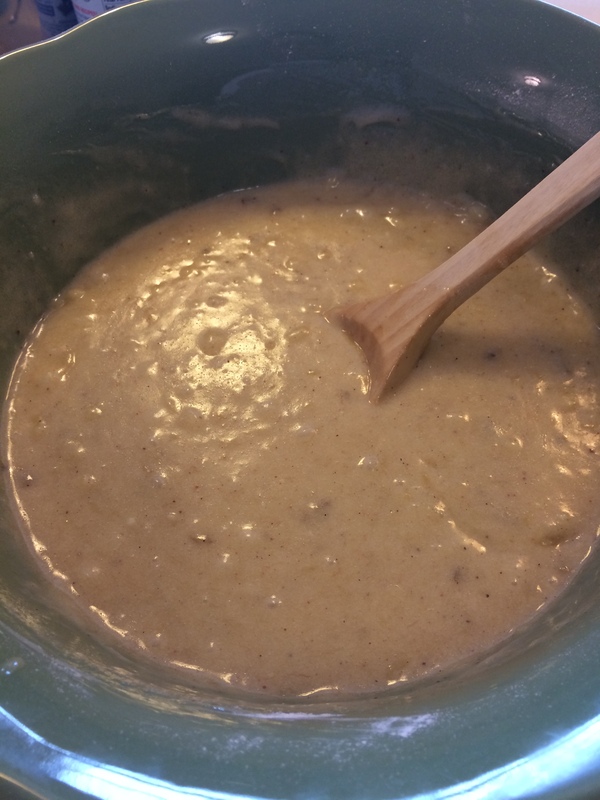 It is Dominique Ansel’s recipe for Banana Bread. While my other banana bread is amazingly delicious it contains brown sugar and a streusel type crunchy topping which makes it more like a cake than a bread. This is delicious served as a bread or with something delicious spread on top of it, butter, jam or even peanut butter. It is pantry ready except for the bananas which I happen to have 4 over ripe ones sitting around. All other ingredients should be in your pantry . I use an electric mixer to mix bananas and eggs because I like the consistency of it done this way. If you don’t have an electric mixer you can mash the bananas by hand and beat in one egg at a time. The bread will start browning early on and this is OK, it forms a wonderful brown crust from all that butter! Mine never got burned. You will also need a loaf pan. This is a large loaf so I filled my standard loaf pan and poured the excess into a small mini loaf. I used a 9×5 loaf pan filled about 3/4 to the top. This bread will turn brown quickly just be careful not to burn it so check on it after 50 minutes. I actually baked for only 60 minutes and it was perfect. Brown and crispy on the outside and moist and delicious on the inside. A really perfect banana bread. You can also use 3-4 mini loaves and they will probably cook in 30 minutes or so. You’ll have to check because it really depends on your oven. I checked mine with a cake tester and it came out clean so I knew it was done. If you touch center of cake it should spring back . I made this banana bread without nuts but if you’d like add some chopped walnuts. Totally optional and about 1/2 cup would be enough for this recipe. Nothing to stop you from adding some chocolate chips either. 14 Tablespoons unsalted butter, melted–yikes I know!!! In a large bowl, combine the dry ingredients. Sugar, Flour, Baking Soda, Nutmeg, Salt and Baking Powder. In bowl of an electric mixer I place the bananas and with paddle attachment beat the bananas into a mush. I then add one egg at a time and beat each one in. Mix the wet ingredients with the dry ingredients and mix until just combined. Don’t overmix. Stir in the melted butter until fully incorporated. Pour the batter into loaf pan and bake until golden brown or a cake tester inserted into the center comes out clean, about 60-70 minutes. Check after 50 minutes to be sure. Allow to fully cool before slicing. At least 1/2 hour. I will probably freeze this bread so I will allow to completely cool before freezing as well. This entry was posted in Baked Goods, bread and tagged banana bread, Bananas, Simple Banana Bread. Bookmark the permalink.